The Exclusive Option Leather Front Seat Cloths Hook Trims feature hand sewed seams that complement the rich leather surface. 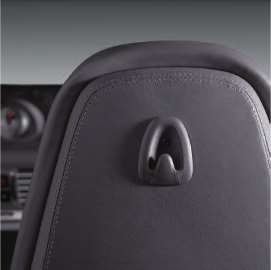 These leather crafted cloth hooks are a simple 1-screw installation that instantly adds an exclusive look to the backside of your standard or sports seats alike. Sold as a set of 2 for both left and right sides. Replacing the cheap volcano grey plastic with rich leather gives your Porsche an exotic feel that might cause you to think twice before hooking up your dry cleaning next time.